Learn Business Building and Brand Strategies that Separate the Average Business Owner from Highly Paid Experts! Debbie Allen helps small business owners and entrepreneurs gain instant clarity and fast marketing results from her personalized mentoring programs. Her clients are a diverse group of business people from around the world who are all committed to becoming the best-of-the best by showcasing their business and personal brand as the go-to expert in their niche industry. They all have the same goals in mind … to expand their brand awareness, grow their business faster, and learn new skills that will allow them to gain high-value clients and increase their income. And most importantly, they don’t want to wait around for months or years trying to figure it out on their own. 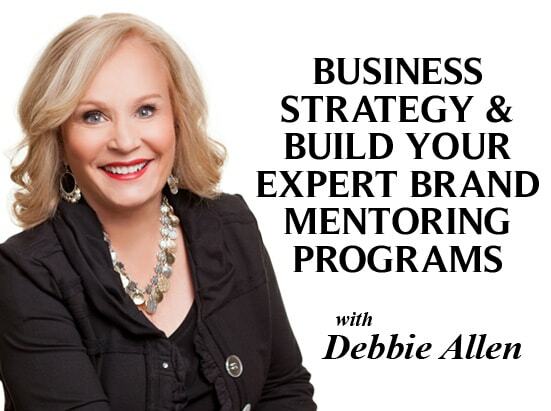 The difference between Debbie’s mentoring program and many other mentors or consultants is that she is personally committed to growing her client’s businesses. She works with her clients 1:1 and gives them a tailored step-by-step action plan that allows them to achieve the highest level of success possible. As a business mentor, Debbie leads with both her head and her heart. This personalized business and brand development program is designed to develop a new expert business or for an existing expert who needs to reinvent branding and target market direction. From the very first call, you will gain instant clarity and direction so you can put more confidence in your expert brand, target market and market positioning to gain more high quality clients and more income. Within 90 days you will have a very focused marketing direction and a clear plan of action. Contact Us for Current Investment Offer Specials and Payment Plan Options. This personalized business and brand development program, is designed as a complete business-building model for a new expert business, or to quickly expand an existing business to “authority” status. From the very first call, you will gain instant clarity and direction that will give you more confidence in your overall business and help you gain high value clients and more income. This extended mentoring program includes social media branding. A WordPress Website will be designed and built for you (mobile enabled), including professional copywriting support from Debbie for every page of your website. This program also includes attendance to Debbie Allen’s very personalized small group, VIP Speaker Sales Training. This very Exclusive VIP mentoring program offers personalized business and brand development plus ongoing mentoring support and an accountability partner for a full year. This program is designed for experts with a Big Vision who want strategic business planning and an action plan for business growth, expansion, product, webinar, and/or event development. VIP Exclusive is limited to only 10 clients per year due to the extensive private mentoring access to Debbie Allen. VIP clients also receive a very special 1:1 VIP Day in Phoenix, AZ at Debbie’s personal residence where clients stay in her private guesthouse and are treated to a complete VIP experience. This exclusive VIP Experience includes a personalized 1:1 business mentoring day with Debbie Allen on-site. During this extremely focused business growth day, you will develop a step-by-step plan of action to expand your business. A detailed marketing plan will be created for you, along with plans to develop additional income streams to help you quickly expand your income. At the end of this extremely focused VIP Day you will walk away with a comprehensive plan of action and a detailed timeline to achieve your goals. An overall business plan will be created for you from 6-12 months. This unique VIP Day provides quick, actionable solutions that allow you to go further and faster to achieve fast results. This personalized 1:1 on-site VIP Day Experience is very limited. Therefore, Debbie also offers a Virtual VIP Day Experience that is available for either a half day or full day for clients anywhere around the world. Virtual VIP Days are conducted via Skype for three hours at a time. Contact Us for more details on Virtual VIP Day pricing. Clients Rave About Working with Debbie! Please complete the questionnaire in full, so that Debbie may personally review your business information in advance of the call. This will allow her to best serve the needs and/or concerns of your business. On the call, Debbie will personally help you gain more focus and instant clarity and will also offer solutions for brand strategy, marketing improvement, and business growth.